Custom Lenticular Door Hangers Printed in Full Color in Bulk. Free Custom Shape! Promotional, Inexpensive. 3-1/8" x 8". Budget Prices in the USA and Canada. 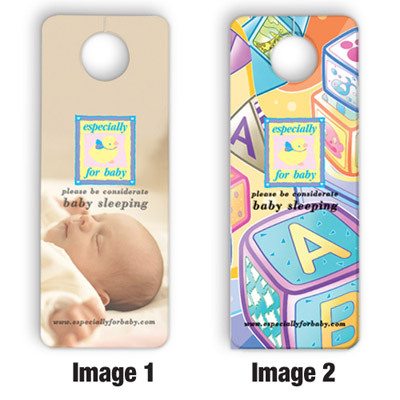 Wholesale advertising Lenticular Door Hangers on sale. Free Full Color (4 Color Process) imprint on one side. No additional charge for custom shapes. Rounded corners. 3 1/8" W x 8" HLowest cost in North America. Free Artwork Design. American Clients pay no taxes. The unit prices below include you full color custom imprint on one side. Add the amont shown for imprint on the back. No Setup Charge! Approx. Dimensions: 3 1/2" x 8"